Covers the water of Lake Isabella. 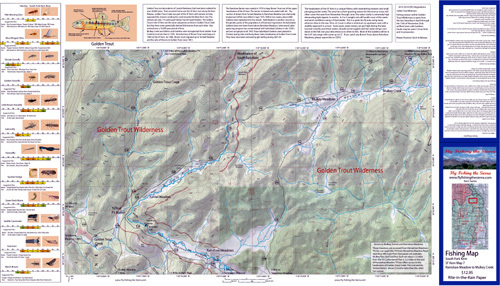 Shows camping areas, road access, trails, and below-surface stream channels. Special Features are Suggested Carp Flies, Fishing Season and Regulations, Fish Identification, Where to Fish, and Stream Etiquette guidelines. Printed on Rite-in-the-Rain Paper that will allow you to write those special notes. Waterproof and Durable. Covers the water between Kernville and Johnsondale Bridge. Shows camping areas, road access, trails, and creeks. 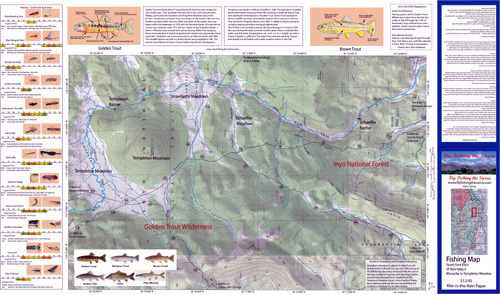 Special Features are the Hatch Chart, Fishing Season and Regulations, Fish Identification, and Stream Etiquette guidelines. Printed on Rite-in-the-Rain Paper that will allow you to write those special notes. Waterproof and Durable. Covers the water between Johnsondale Bridge and Forks of the Kern, includes much of the Little Kern. Shows camping areas, road access, trails, and creeks. 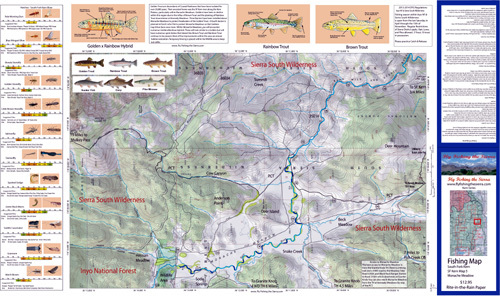 Special Features are the Hatch Chart, Fish Identification, Fishing Season and Regulations, and Stream Etiquette guidelines. Printed on Rite-in-the-Rain Paper that will allow you to write those special notes. Waterproof and Durable. Covers the water between Forks of the Kern and Hole in the Ground. Shows camping areas, trails, and creeks. 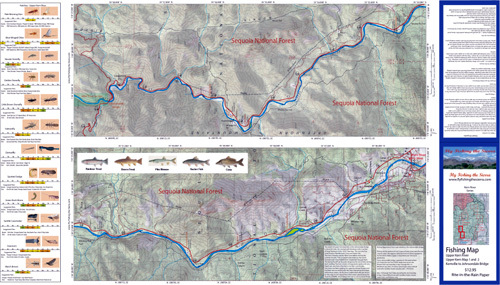 Special Features are the Hatch Chart, Nymph Rigging, Fishing Season and Regulations, and Stream Etiquette guidelines. Printed on Rite-in-the-Rain Paper that will allow you to write those special notes. Waterproof and Durable. Covers the water between Hole in the Ground and Kern Canyon Ranger Station. Shows camping areas, trails, and creeks. 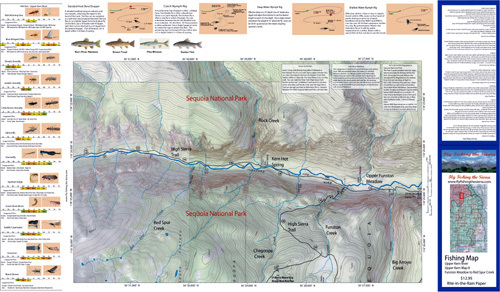 Special Features are the Hatch Chart, Nymphing Rigs, Fishing Season and Regulations, and Stream Etiquette guidelines. Printed on Rite-in-the-Rain Paper that will allow you to write those special notes. Waterproof and Durable. Covers the water between Kern Canyon Ranger Station and Rattlesnake Canyon. Shows camping areas, trails, and creeks. 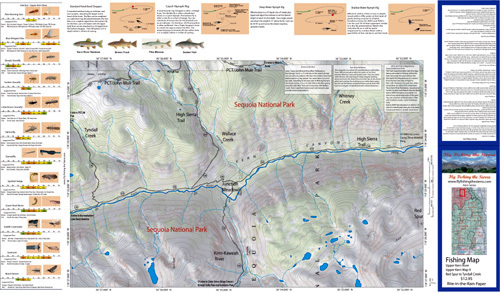 Special Features are the Hatch Chart, Nymphing Rigs, Fishing Season and Regulations, and Stream Etiquette guidelines. Printed on Rite-in-the-Rain Paper that will allow you to write those special notes. Waterproof and Durable. Covers the water between Funston Meadow to Red Spur Creek. Shows camping areas, trails, and creeks. Special Features are the Hatch Chart, Nymph Rigging, Fishing Season and Regulations, and Stream Etiquette guidelines. Printed on Rite-in-the-Rain Paper that will allow you to write those special notes. Waterproof and Durable. Covers the water between Red Spur Creek to Tyndall Creek. Shows camping areas, trails, and creeks. Special Features are the Hatch Chart, Nymph Rigging, Fishing Season and Regulations, and Stream Etiquette guidelines. Printed on Rite-in-the-Rain Paper that will allow you to write those special notes. Waterproof and Durable. 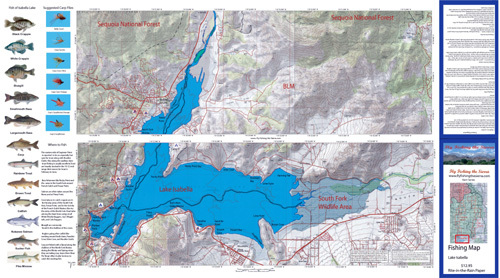 Covers the water between Lake Isabella and Rockhouse basin. Shows camping areas, trails, and creeks. 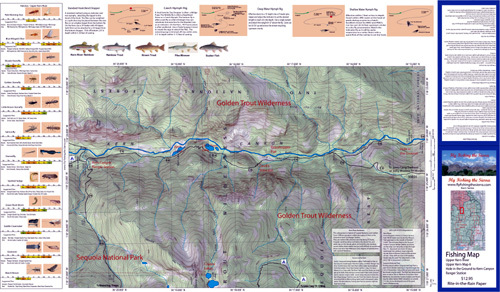 Special Features are the Hatch Chart, Fishing Season and Regulations, and Stream Etiquette guidelines. Printed on Rite-in-the-Rain Paper that will allow you to write those special notes. Waterproof and Durable. Covers the water between Rockhouse Basin to Clover Meadow. Shows camping areas, trails, and creeks. 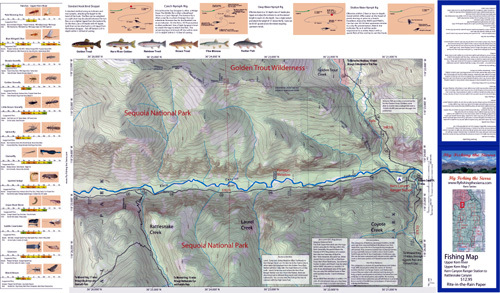 Special Features are the Hatch Chart, Fishing Season and Regulations, and Stream Etiquette guidelines. Printed on Rite-in-the-Rain Paper that will allow you to write those special notes. Waterproof and Durable. Covers the water of Monach Meadow. Shows camping areas, trails, and creeks. 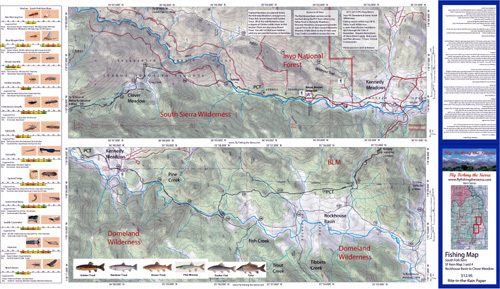 Special Features are the Hatch Chart, Fish Identification, Fishing Season and Regulations, and Stream Etiquette guidelines. Printed on Rite-in-the-Rain Paper that will allow you to write those special notes. Waterproof and Durable. Covers the water between Monache Meadow to Templeton Meadow. Shows camping areas, trails, and creeks. 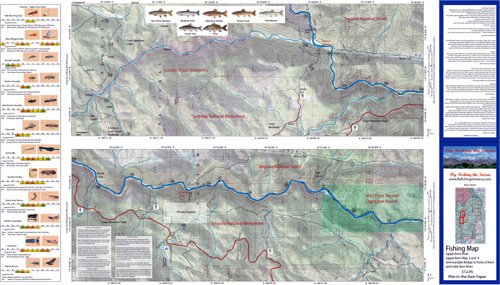 Special Features are the Hatch Chart, Fish Identification, Fishing Season and Regulations, and Stream Etiquette guidelines. Printed on Rite-in-the-Rain Paper that will allow you to write those special notes. Waterproof and Durable. 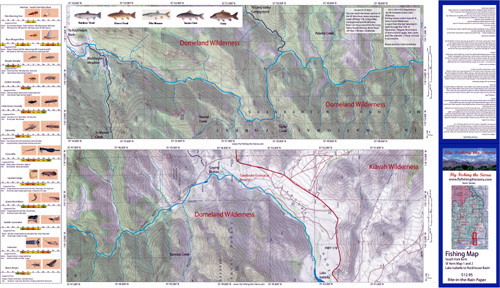 Covers the water of Ramshaw Meadow to Mulkey Creek. Shows camping areas, trails, and creeks. 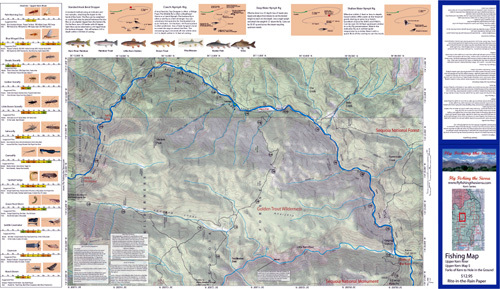 Special Features are the Hatch Chart, Fish Identification, Fishing Season and Regulations, and Stream Etiquette guidelines. Printed on Rite-in-the-Rain Paper that will allow you to write those special notes. Waterproof and Durable.